Aaron Copland was important in creating an American style of classical music during the 1900’s. His creativity and innovation led him to create an “indigenous” musical sound that captures the American spirit. This means he used music from our own country, such as jazz, folk music, cowboy music, or early American songs, to set American music free from the traditional styles of music written in Europe. 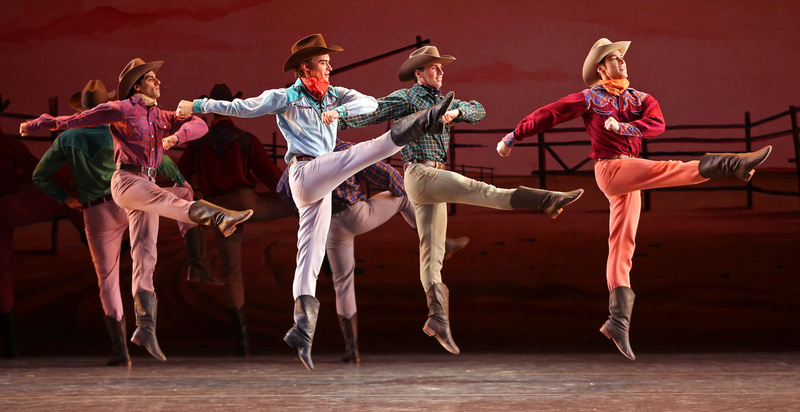 Some of these works include American ballets titled Billy the Kid, Rodeo, Appalachian Spring, and other classical works such as the Grand Canyon Suite. One of the distinctive characteristics of Copland’s writing is the way it creates musical images of our country. 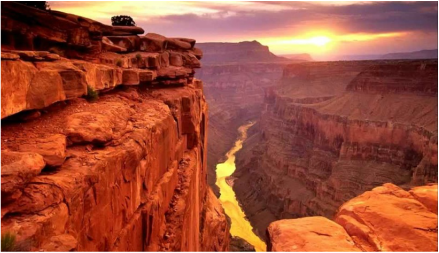 For example, when you hear his music, you can imagine covered wagons rolling across the wide expanse of the open prairies, or the huge Grand Canyon. Some of his music creates a mental image of pioneers dancing after a new barn has been raised. Copland’s life and his work continue to inspire the imaginations of many of today’s young composers and music listeners. 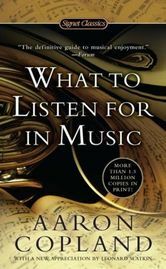 Some of Copland’s writings have been published, including an important one called “What to Listen for in Music.” So Aaron Copeland has influenced what music teachers teach in their classrooms and the things you learn to listen for during our morning assemblies! 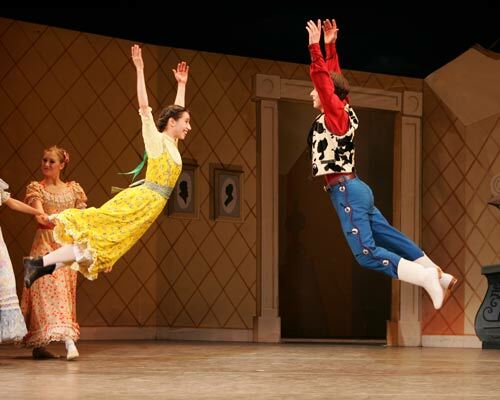 Our listening example is from the ballet called Rodeo. 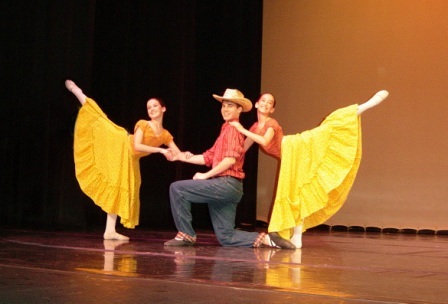 As the title suggests, it has a western theme and is a dance called “Hoedown”. A hoedown is a “shindig” or barn dance, similar to a square dance. 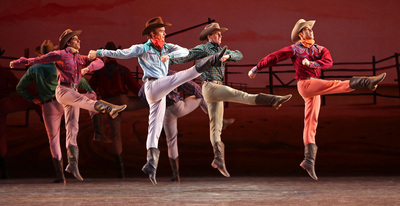 It is energetic and uses the rhythms and harmonies associated with cowboy music. 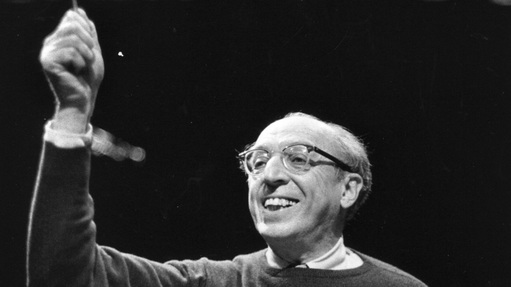 In addition to his ballets and orchestral works, Copland produced music in many other genres including chamber music, vocal works, opera and film scores. Brass and percussion instruments have been featured in much of Aaron Copland’s music to create a mood of importance and power. His composition called Fanfare for the Common Man has become a standard in American patriotic music and features these families of the orchestra. 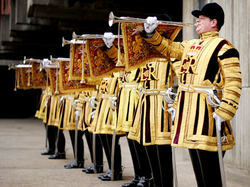 A fanfare is music played before something important happens, or before an important persons enters a room. 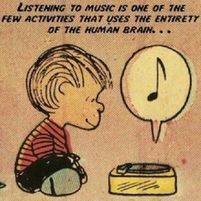 It is almost always played by brass instruments. 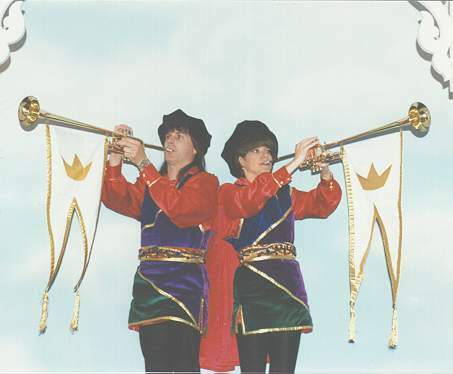 The bright sounding trumpets create excitement, while the lower sounding French horns and trombones are used to give a feeling of strength and power. This music was inspired just before World War II by a speech containing the quote, “the century of the common man has arrived”. Like other great classical music, this fanfare has been used in TV shows, commercials, football pre-game shows, as an entrance for Queen Elizabeth II, and to honor Veterans’ Day. Copland created a feeling of dignity and stateliness when he composed this popular fanfare. The music gets the listeners attention from the very first by beginning with the crash of a gong and pounding timpani drums. In the 1940's, Aaron Copland wrote very descriptive music for the first truly American ballets. 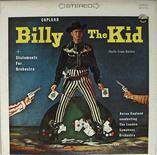 One of these was Billy the Kid, about an old western gunfighter. 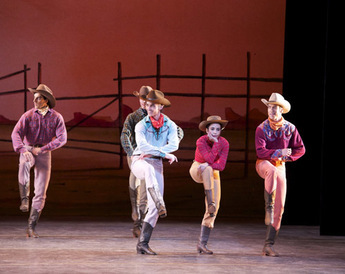 Another Copland ballet was Rodeo, a story about cowboys and cowgirls. Appalachian Spring is about young pioneers getting married in the Appalachian Mountains in Pennsylvania. “Buckeroo Holiday” opens with a grand fanfare until the cowgirl’s theme appears. 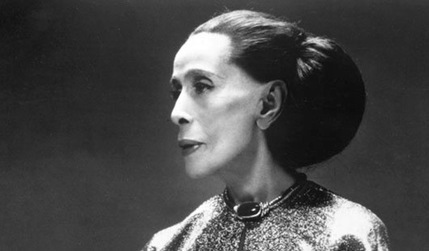 Copeland’s music was an important contribution because American dance choreographers needed suitable music for their modern American dance style. "Buckaroo Holiday" from Rodeo Dance Episodes. An excellent video of an orchestra playing this selection with great filming of the instruments. 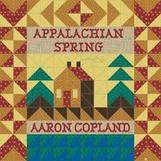 One of Aaron Copland’s most well-known pieces of music is called “Simple Gifts”, from the ballet Appalachian Spring. The original song, written in 1848, was sung by the Shakers, a religious community of the early 1800’s. 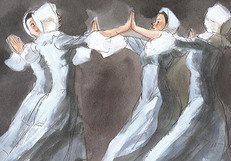 The words to the song describe how the Shakers would dance and turn during their worship services. Today, furniture and items made in Shaker style are considered American “folk art. 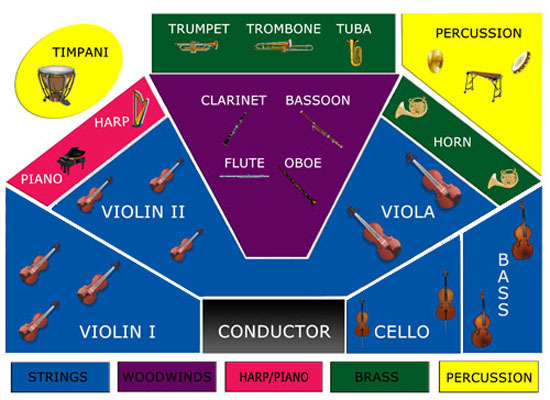 Copland’s orchestra arrangement of “Simple Gifts” is in a form called “theme and variations”, where the melody, or theme, is repeated, but altered in different ways: perhaps slower or faster; with a different mood; or played by different instruments. The variations in this music reflect the American spirit of simplicity, boldness, and majestic grandeur. The Spokane Youth Orchestra opens with the woodwinds playing the theme. The variations change in tempo, character and dynamics. Listening Example: "The Promise of Living"
Aaron Copland lived a long and productive life, and died at the age of 90. 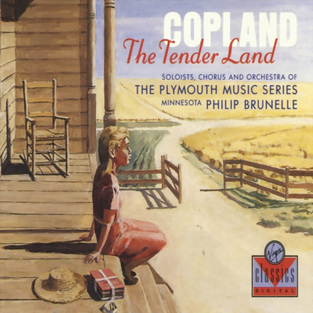 During the Great Depression of the 1930’s, he was concerned about the hardships young people went through, so he wrote an opera about this called The Tender Land. He also enjoyed the challenge of writing music for young performers, so he wrote piano music called “Young Pioneers”. 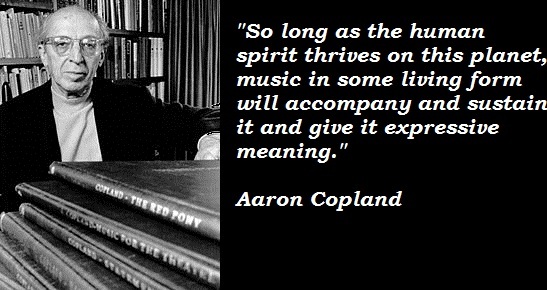 Aaron Copland lived a long and productive life, and died at the age of 90. During the Great Depression of the 1930’s, he was concerned about the hardships young people went through, so he wrote an opera about this called The Tender Land. The final song of the first act of “The Tender Land” was a song titled “The Promise of Living”. The simple lyrics state “The promise of living with hope and thanksgiving is born of our loving our friends and our labor. The promise of growing with faith and with knowing is born of our sharing our love with our neighbor.” These words remind us to be thankful for what we have, and the people around us. Sometimes, composers will take someone else’s work and “rearrange” it. They may change the dynamics or tempo of the piece, but only to honor the work of the original composer. 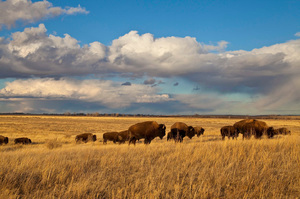 Our favorite composer, John Williams, arranged this particular piece of Copland’s work. You will notice how it sounds big and bold, like most of Williams’ work usually does, but it still has the simple softness of Copland’s work. In 1962 Copland was commissioned by LIFE Magazine to write a piano piece for young musicians which he called “Down a Country Lane”. It is a musical genre called a “pastoral” (pas-tor-al). Pastorals suggest the calm, relaxing atmosphere of being out in the country. Aaron Copland used his imagination and creativity to make his music express the many moods and feelings that people experience in life.